Every year, the arid and desolate Namaqualand region of South Africa explodes into colour with the blossoming of the Namaqualand Daisies. A vibrant and diverse array of spring wildflowers blooms from the earth, bewitching the landscape to resemble an impressionist painting. The wildflowers make their appearance between August and October, most easily viewed at the Postberg Nature Reserve located in the West Coast National Park. 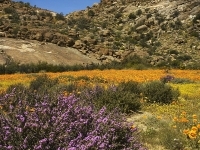 Darling is also a popular spot, featuring an annual Wildflower Show of extravagant floral displays. However, for visitors who really want to experience the full effect of the Namaqualand Daisies, a trip on the Namaqualand Flower Route is highly recommended. A trip on this route will take visitors through the Richtersveld National Park, the Goegap Nature Reserve, the Skilpad Wild Flowers Reserve, and Alexander Bay. One of the stops includes the Orange River estuary, where the glorious tapestries of wildflowers are at their most unrestricted and awe-inspiring best. Namaqualand remains one of South Africa's most famous natural attractions, a wonderful inclusion on any West Coast holiday itinerary.